And that’s a wrap. The calendar year 2014 has just about run its course. It’s all over but the year bird counting, so take stock of any species you’ve added this weekend. 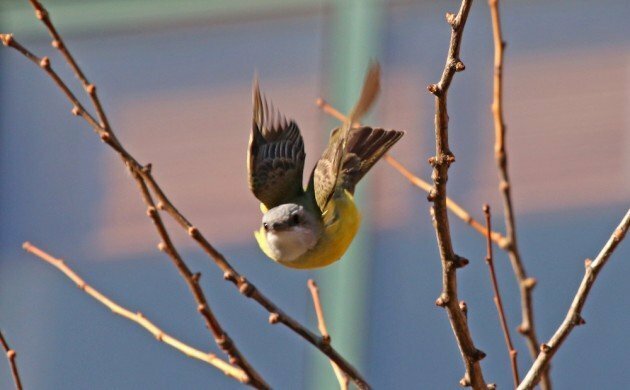 Corey’s Best Bird of the Weekend was New York State’s first Couch’s Kingbird in the incongruous location of the West Village in Manhattan. A more unlikely spot for the first record of a tyrant flycatcher could scarce be imagined but there it was, hawking insects and delighting birders and passersby. What a way to end 2014’s birding. I skipped the kingbird and was just happy to spot the Broadway Bridge Peregrine Falcon! I think it was the lifer pair of Spotted Stone-curlews I saw from a car, managed to get back to and admire before heading back to Cape Town. Probably a bunch of Pine Siskins who together with some American Goldfinches were happily feeding on the large seed balls of American Sycamore trees. Eurasian Kestrel in Nova Scotia. A fantastic way to end 2014! Purple Swamphen: Supertramp or superspecies?